CAPTCHAs have a lot of downsides, accessibility and user friendliness are two things that are often sacrificed. I've thought of an idea that might work really well, has this ever been attempted before? The prerequisite for it is that email verification must be a requirement on your website, which is currently very common. The assumption here, is that the robot will either click the fail link as it's first in the email, or it will click both links. If both links are clicked, we can mark them as a potential bot. It's not a binary pass/fail. 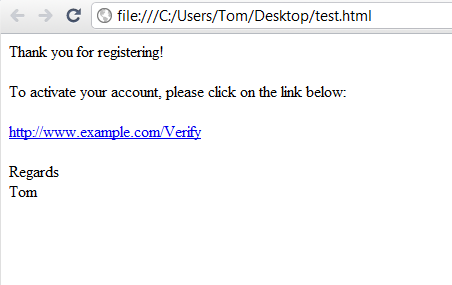 If the fail link is clicked, then you can manually review the account, or resend an activation link. If this method has a lower false positive rate than traditional methods, it's worth having. Not only that, but it's an invisible verification process from the genuine users point of view. Thoughts? Criticisms? Has this been done before? 1) True accessibility. Think, blind people who have their email read to them by the system. 2) Easy to get around. What good is a captcha that someone can write one line of code to beat? If that is all you want you can just ask them what 1+1 is. The problem is that this sort of approach works only so long as it is sufficiently rare that bot writers can't be bothered to code for it. As soon as this sort of approach becomes slightly widespread, bot writers will simply modify their code to defeat it. There are plenty of sites that have relatively simple to defeat systems (i.e. answer a simple arithmetic problem, type "I am a human" in a box, etc.) that work because they are sufficiently idiosyncratic and the sites sufficiently low profile that it isn't in the bot writers interest to bother coding for them. If you were going to include a honeypot link, however, you're probably better off hiding it from humans by making it practically invisible to humans-- i.e. the smallest font with a color that matches the background or a 1-pixel image that matches the background. That at least makes it less likely that a human would inadvertently click the wrong link. Well first off this solution relies on a few assumptions about the robots that would be signing up to the site, mainly the assumption that the robot will follow the first link it finds in the email. And all of this assumes that the robots that would be attacking the site are generic robots that are not familiar with your sign-up process. If the robot comes back with an error to whoever is monitoring it saying it can't sign up, then the developer could very easily write code to workaround any such HTML tricks you might write. Altogether however I think that it's not too much of a problem to tell the user that they should turn HTML on for even just the one email, it might keep robots out for at least a while before someone bothers to write the code to bypass it, and if you can hide a non-empty <A> tag before the real link then you might as well give it a try and see what happens! The best "CAPTCHA" of all, it's used by Gmail when someone try to create a bulk of emails accounts. You write your phone number, and select if you want a call or a SMS. They send you via call or SMS, the code to write it in the form. Obviously, this system has a cost, but I think it's the best. Not the answer you're looking for? Browse other questions tagged email captcha or ask your own question. Is using xml + xsl to create a weekly html email a good or bad idea? Bad idea to display mail server info in public github project? How to implement an email unsubscribe system for a site with many kinds of emails? What's a reasonable limit for email confirmation re-sends? What is email ingestion and are there modern uses for that technology?